Ed Kavanaugh, a Holy Cross icon for almost four decades, lost a battle with cancer on October 27th at the age of 66. Kavanaugh was a student, wrestling coach and athletic director at Holy Cross before being forced to move to the Baton Rouge area due to Hurricane Katrina. 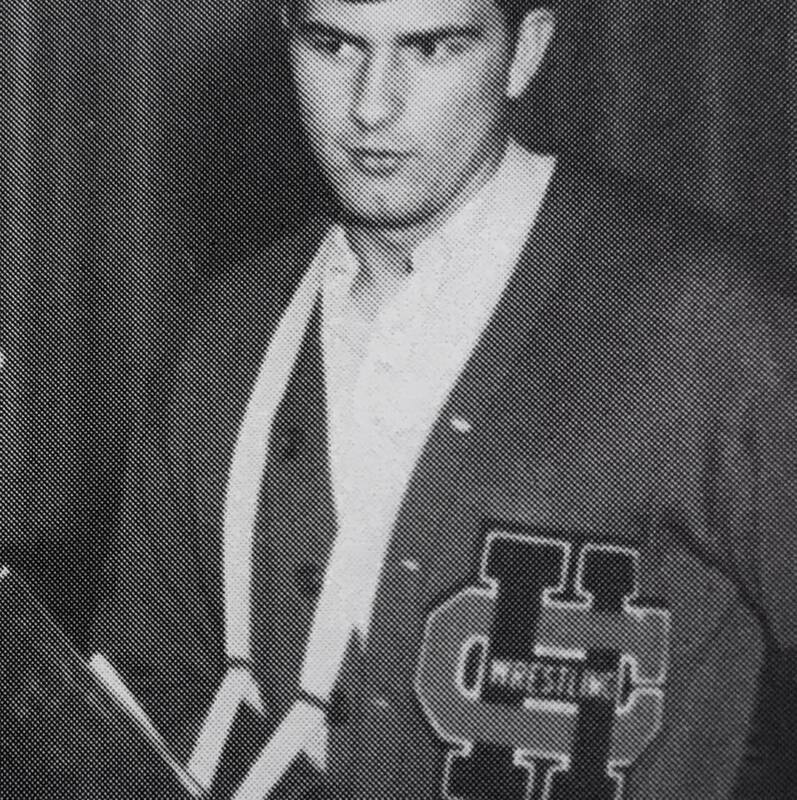 In 1967 Kavanaugh, a senior heavyweight contender, won an overtime match against De la Salle's Phil Nicaud to help Holy Cross regain their state championship form after losing the previous year to East Jefferson. Prior to that the Tigers had won 14 titles in a row. In 1972 Coach Kavanaugh took the reins of the Holy Cross wrestling team from Brother Melchior Polowy, who started wrestling in the New Orleans area. Between 1972 and 1996 Kavanaugh's Tigers won two state team titles (1983 and 1987), and placed in the top five four times. Twenty-six of his wrestlers won state championships during his tenure as coach. 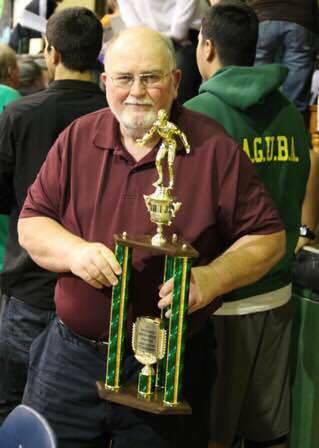 In the post-Katrina years from 2007-13, Coach Kavanaugh, while living in Ascension Parish, travelled daily to coach wrestling at Chalmette High School. Ed Kavanaugh: 1950-2016 Coach Kavanaugh with his wife, children and grandchildren. Chalmette coach Ed Kavanaugh was recognized with the first "Ray Gremillion Coaching Distinction Award" presented by Grace King Coach Roberto Furtado in 2012. 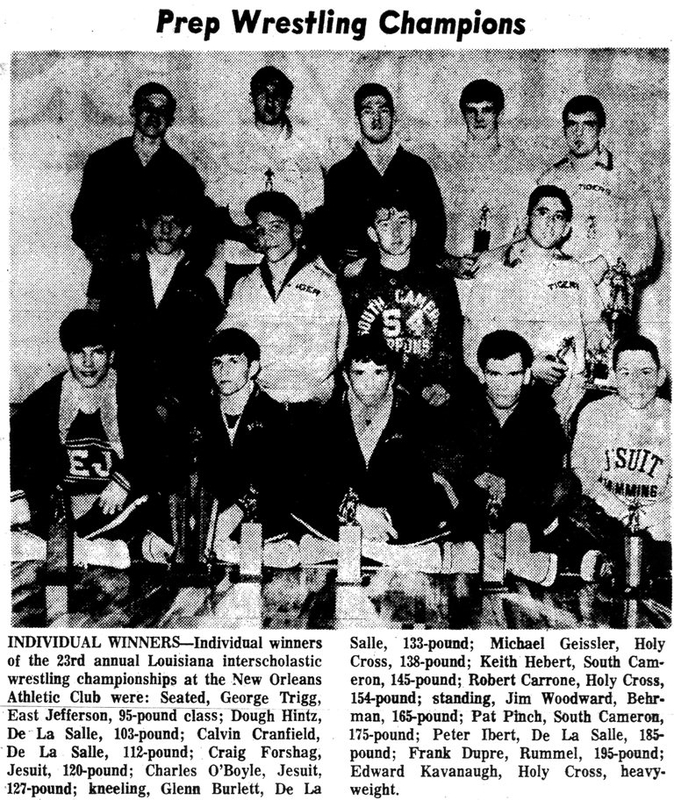 Ed Kavanaugh after winning the 1972 Louisiana State Wrestling Tournament. Ed Kavanaugh, standing at far right, with the other individual state champions of 1967. Kavanaugh's name was one of 238 Holy Cross state wresting champions honored on the new Holy Cross Wrestling Wall of Champions, which was dedicated on October 22nd. Marcus Tullius Cicero, one of ancient Rome's preeminent philosophers and orators, said "The life given us is short; but the memory of a well-spent life is eternal." In 1984, Ed hired me to help at Holy Cross. My fondest [memory] is one of his ability to negotiate compromise at the most important time. [The City Tournament finals were being held up via a request for more money for the officials.] Ed and [the head official] went into a room and talked about a solution. Some things were said that upset Ed terribly and Ed stormed out of the meeting. Several coaches tried to calm Ed down, trying to get him to go back and get something done. Ed remained furious. I went to talk to Ed and he told me not to tell him to calm down. Instead I told Ed that I supported his actions 100% and would show my support by holding [the official] down while Ed pummeled him. Ed looked at me laughed and finished the negotiations to a successful conclusion. 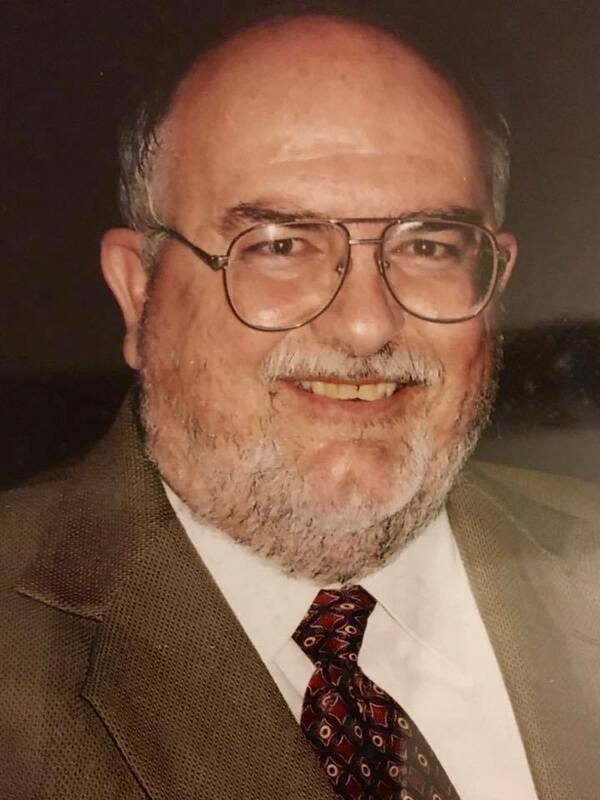 Edward Kavanaugh, age 66, passed away peacefully October 27th, 2016 at Our Lady of the Lake Hospital in Baton Rouge. Ed battled cancer for years before yielding. Originally from New Orleans, Ed relocated to Prairieville after Hurricane Katrina. 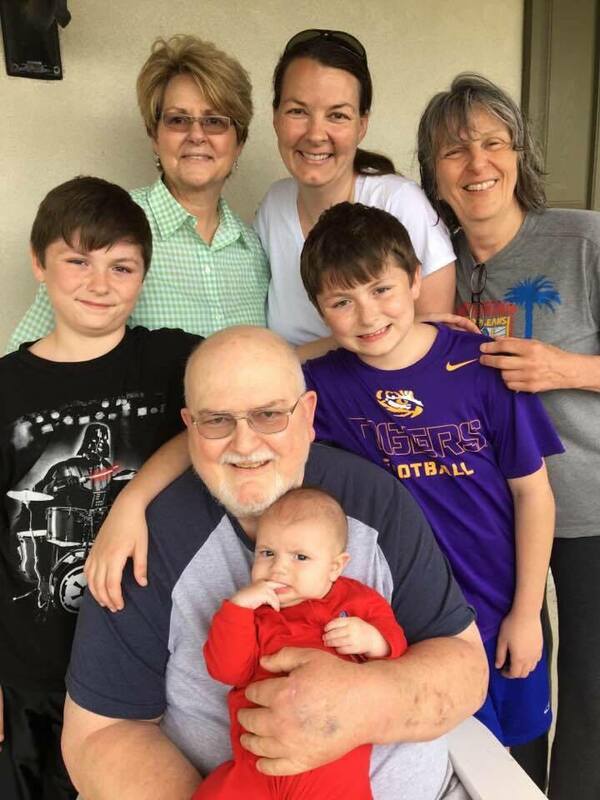 A loving husband, father, grandfather and brother, Ed was an educator his entire career beginning as a wrestling coach at Holy Cross in New Orleans and finishing as the principal of St. Louis King of France in Baton Rouge. Ed impacted countless students and athletes, drawing on his own experience as a wrestling State Champion and graduate of Louisiana State University who went on to get his Master's degree and never stopped learning. There was no greater beneficiary of his unconditional love, kindness, wisdom and support than his family. Ed is survived by the love of his life, Dianne, who stood by him in marriage for 43 years, his two children, Kelly and Kevin, his son-in-law Paul Angrisano and daughter-in-law Casey Kavanaugh. Ed is also survived by his grandchildren Aidan, Evan, Paul and Quinn, as well as his brother and sister, Patrick Kavanaugh and Edwina Kavanaugh. He is preceded in death by his parents, Edward J. Kavanaugh and Frances Kelley, and his sister, Georgianna Kavanaugh. Visitation will be held at Resthaven Gardens of Memory and Funeral Home in Baton Rouge Saturday, November 5th from 11 a.m. until Catholic Mass at 2 p.m. Burial will follow. In lieu of flowers, please make donations to in memory of Andre' Colletti (tribute number 31101869). Family and friends may sign the online guest book or leave a personal note to the family at www.resthavenbatonrouge.com.